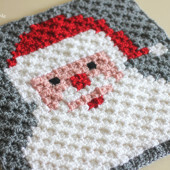 Two years ago I had the pleasure of creating this Polar Bear C2C Blanket for Simply Crochet Magazine! It was published in Issue 50 which you can read about HERE. Luckily I am now able to also share the pattern right here on my blog for free! YAY!! It’s the perfect project to hook up for Christmas or the winter season. – Bernat Super Value Yarn (I originally used Special Aran yarn sent to me by Simply Crochet. I believe it is only available in the UK). Bernat Super Value would be a great replacement. I would go with colors Cool Blue or Aqua (2 skeins), White (2 skeins), Berry Red, with a bit of gray (or clay) and black. Shop the colors at Yarnspirations.com! I used the corner-to-corner crochet method to make this blanket. First you will want to download the Polar Bear Pixel Graph. You can do that HERE. When you are done, it will be reversible! The same image will appear on either side (the polar bear will just be facing the other direction). If you aren’t familiar with the C2C technique, I have a video class available HERE for purchase that teaches you this technique! 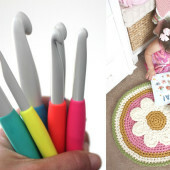 The CrochetCrowd also has a very helpful video tutorial for FREE that shows you the basic technique of corner-to-corner crochet. Check that out HERE. 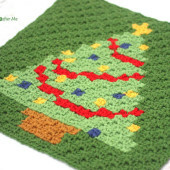 When you are finished crocheting the graph using C2C crochet, you can add a snowflake border! Round 1: With white yarn, SC to join between any of the squares on the edge. Chain 2 and SC in the next space between squares. Repeat around all edges making a SC + Chain 2 + SC in the corners. Round 2: Slip stitch + Chain 4 + Slip stitch in the first chain 2 space, chain 4 and skip next chain space, slip stitch + chain 4 + slip stitch in the next chain space, repeat around making a SC + chain 2 + SC in the corners. Round 3: [slip stitch, SC, chain 2+ slip stitch in second chain from hook, SC, chain 3 + slip stitch in second chain from hook and last chain, SC, chain 2 + slip stitch in second from hook, SC, slip stitch all in one chain 4 hump], make 3 SC in next chain 4 space, repeat from * in next chain 4 hump, repeat around making a SC + Chain 2 + SC in the corners. Join, fasten off and weave in ends. If you like this blanket you might also like my Polar Bear Cub C2C Blanket! 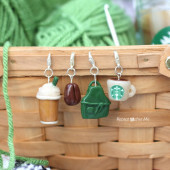 You can find the pattern for that cute project HERE. Do you teach this pattern in your C2C class? It’s wonderful! Thanks for sharing!